I think that every kid has this imaginary perfect dad. At least when the period when they adore they dad is over. For some, it’s MacGyver. Who wouldn’t want him as a dad anyway? If you’re a sucker for Star Wars though, you might have dreamt about having Darth Vader as your dad at one point. Or not. Whether or not you had that dream, as long as you think Star Wars is cool, then this shirt from shirt.woot! will appeal to you. Darth Vader as the World’s Greatest Dad. Not only does he have a cool apron to go with the role, but he actually is seen frying up some eggs for who might very well be the luckiest kid on earth! I do wonder how Darth Vader would react if his kid doesn’t like the way the eggs are done. The t-shirt design is created by ramyb of Baltimore, Maryland, and it costs $15. If you are patient and can wait for a few days, standard shipping within the United States is free. If you have a low EQ and want this shirt NOW (well, you have to wait over night), then you add $5 to the bill. Here’s good news for those who are not located in the United States and want a shirt with the world’s greatest dad printed on it – international shipping only costs $5 as well! Of course, depending on your location, you can wait months or forever for the shirt to actually get to you. 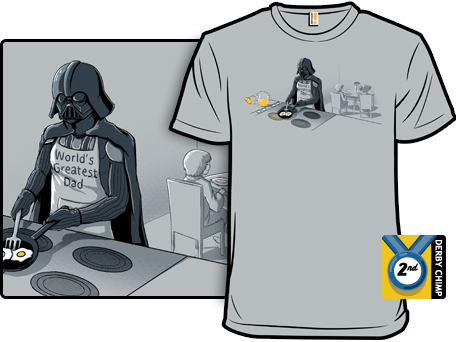 Get your Darth Vader shirt from shirt.woot! now!